A very unusual and interesting, antique, reclaimed internal pine door with opening window panels. The door probably originates from France. The door has raised and fielded panels and the top panels opening inwards and are ready for glazing. The back of the door is stripped to bare wood and the front has a wax or varnish finish. We can glaze the door for an EXTRA CHARGE. Please contact us to discuss your requirements and for a quote. The door is quite thin and would therefore be suitable for internal use only, or perhaps for a cupboard or wardrobe front. Due to age there are some signs of wear and use. The front has some scratches, marks and wear and would benefit from stripping and refinishing. There are holes and marks where the door hardware are has been removed. There are some crack, knocks and surface splits. The window frames have some light holes and knocks. Some puttied holes can be seen. Tarnish to the hinges and screws. The hinges do not have the pin piece that attaches to the wall. The door height varies very slightly. 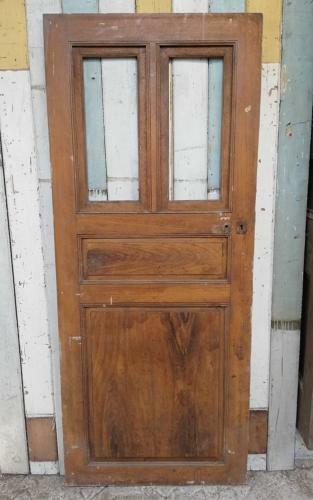 The door is a lovely and unusual item and would make a fantastic feature within a home.